I’m the new kid on the block in this incredible blogging community and I have no idea how all of you are so prolific. Week after week, meme after meme, publication after publication, all while supporting each other—you amaze me every day. I’m treading water to keep up, fighting off cliches with a bat (and losing). Too many projects! A cause for celebration, and also a cause for saying no occasionally. Alas, this week’s Wednesday post must be put aside to make time for other writing. I’ll be back soon! Meanwhile, the responses to the prompt over at Rebel’s Notes this week are so excellent. Check them out! 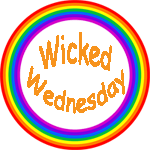 Visit the fab Wicked Wednesday “Advert” entries here! I don’t think you’re losing the cliche battle at all – you’re one of my favourite blog discoveries of the past year. And the look of your blog is *stunning* too.